At six, Julia Narveson wanted a DAMPIT small enough for her violin. 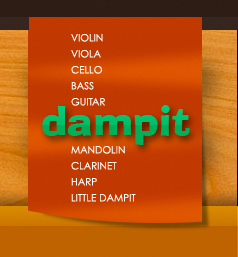 Unable to find one, her mother encouraged her to write a letter to the inventor of the DAMPIT, suggesting he consider manufacturing a “little DAMPIT for little violins”. Hollander was so intrigued by the letter, that he wrote Julia asking for her help. Julia responded by sending Hollander a drawing of what the little DAMPIT might look like and he responded by making her one by hand. Shortly after, Hollander began to manufacture the little DAMPIT. He asked Julia to create the lettering for the slogan “Little DAMPIT for Little Violins” and to do a drawing for the packaging. Three years later, Julia and Hollander met when he visited her in Canada to hear her perform in a Suzuki school recital. Julia’s art work is still used today in the advertising materials. The Little DAMPIT is now distributed world-wide. Today, Julia lives in Montreal, plays a lot of music, and does illustrating.